It is no secret at all that my future will definitely have me finally getting my chance to compete in a figure competition. It has been something that I have always wanted to do, something I talk about a lot. But it’s not easy, and it’s not cheap. Finances, a job that is flexible and understanding are all things that go a long way in the competition prep world. While my current job as a sports writer and photographer is pretty flexible, it’s not quite as open as it would need to be for me to be able to dedicate the time to a competition. I’ve got the knowledge, the drive and the dedication, the rest just needs to click into place for me. But things are constantly changing, and that goal of mine is getting closer, and closer. In the gym one day, about two weeks ago, I got a facebook invite for an event. 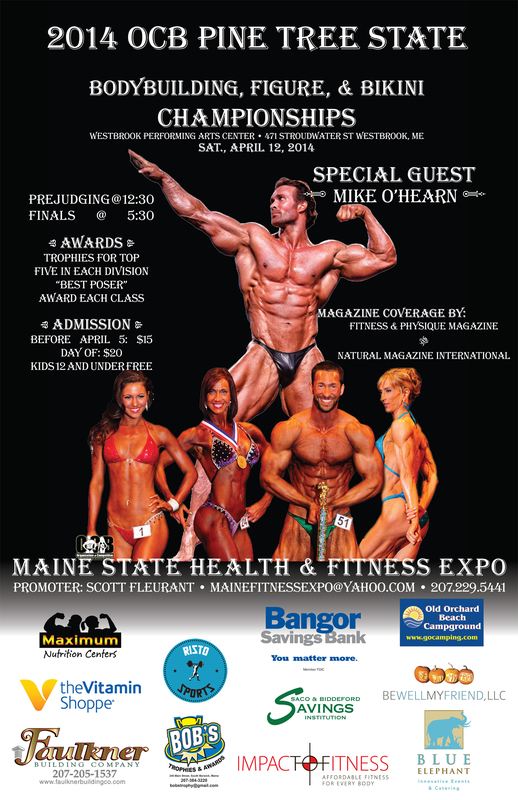 The Maine Fitness Expo and OCB Pine Tree State Bodybuilding, Figure & Bikini Championship. I saw that it happened to fall right as the Spring high school sports season would be picking up and was bummed that because of that fact, I probably wouldn’t be able to make it. Then I noticed that it was only about an hour and a half away. Reading more details, the name Mike O’Hearn jumped out at me. Wait. Mike O’Hearn? THE Mike O’Hearn? No, no way. Has to be a coincidence on the name. Has to be. Shot a quick message off to my friend who passed the event page along to me, and sure enough, it really is Mike O’Hearn that will be there. I dropped my water bottle, ran a lap around the gym, fist pumping while my shouts of joy bounced off the walls of the joint. I bought my ticket the second I got home. Not only would I get to see my friend compete, but I’d get to listen to O’Hearn speak during the seminar portion of the event. Hot damn life was good. A few days later, my competing friend found out that her competition trainer couldn’t make it to the competition. Suddenly, I had gone from being just an attendee, to competition day trainer. The excitement and terror are battling inside of me something wicked. It’s going to be a hell of an experience. It’s going to fuel my desire to compete myself even more. My brain is going 90-miles-per-hour going over every little thing that will need to happen that day. Knowing walks, poses, cues, that’s only half of it. There are those who say that it’s easy, it’s no big deal, but they haven’t a clue what actually goes into and on during a competition. One month out… time to kick this up a notch and hit overdrive.